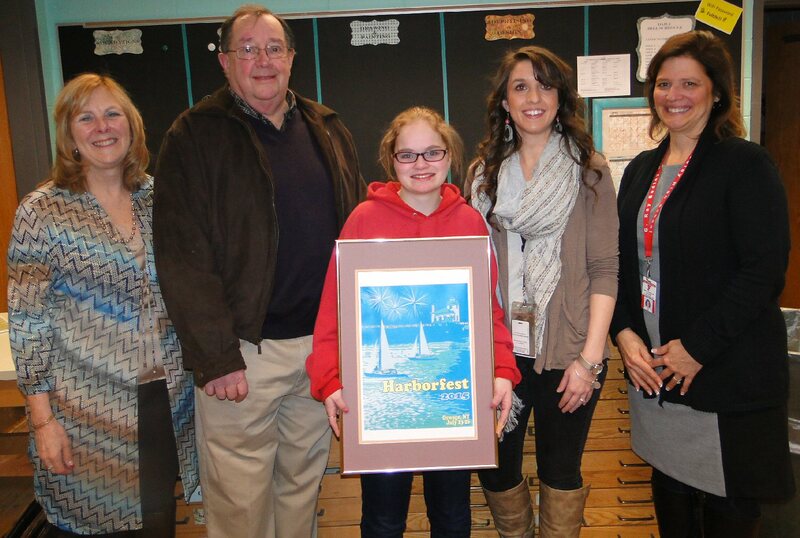 FULTON, NY – G. Ray Bodley senior Chlarissia Crast created the poster design for the 2015 Oswego Harborfest. G. Ray Bodley senior Chlarissia Crast is congratulated for her award winning poster design as it will represent 2015 Harborfest. Joining in the celebration were Harborfest Sponsorship Coordinator Carol Dillabough, Harborfest Executive Director Doug Buskey, Crast, art teacher Jaclyn Tyler and G. Ray Bodley Principal Donna Parkhurst. In a brief ceremony in the Fulton High School art room Crast was very emotional and excited when Oswego Harborfest Executive Director Doug Buske announced that her work was chosen to represent this year’s celebration. Art teacher Jaclyn Tyler, in cooperation with Oswego Harborfest Sponsorship Coordinator Carol Dillabough, coordinated the project. Buske expressed his appreciation to all of the students who participated. He told Crast that the poster would appear in the annual program and be on sale throughout the festival and she would receive a professionally framed copy. Buske also invited Crast, her family and art teacher to the annual Harborfest Gala which will be held during Harborfest week. There, she will be publicly recognized for her work. Other students who participated included Callie Beckwith, Alexis Caruana, Victoria Gillette, Hayley Grant, Lina Helmsteader, Jennah Lamb, Gabriella Lanza, Julia Polly, Devin Russell and Cara Todt. 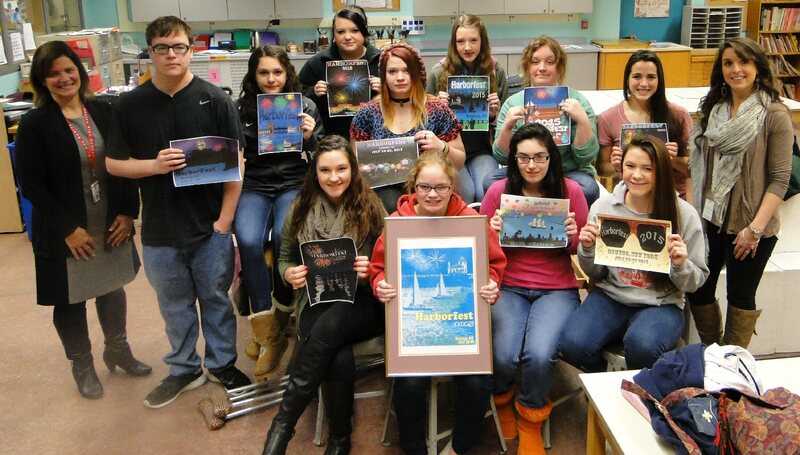 These G. Ray Bodley High School students all participated in the design effort for the Harborfest poster. 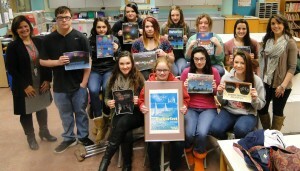 In front (left to right) are Alexis Caruana, Chlarissia Crast, Gabriella Lanza and Jennah Lamb while in the middle are GRB Principal Donna Parkhurst, Devin Russell, Lina Helmsteader, Victoria Gillette, Julia Polly, Callie Beckwith and art teacher Jaclyn Tyler. In back are Hayley Grant and Cara Todt. G. Ray Bodley Principal Donna Parkhurst expressed pride in her students’ work to assist this community festival. Tyler was very supportive of the project and talked about her students’ involvement. This was G. Ray Bodley High School’s first year of incorporating Adobe Photoshop and Illustrator into the Advertising and Design curriculum. However, her hesitation worries were not necessary as the students produced several potential submissions that could have been chosen to be the “face” of the 2015 Harborfest celebration.